Morgan James Publishing, 9781630477806, 160pp. Our current healthcare system is sick, and the cure is simple: We need to bring compassion back to healthcare. 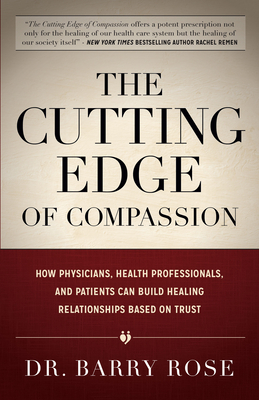 In The Cutting Edge of Compassion, board-certified orthopedic surgeon Dr. Barry Rose reflects on how physicians and patients can create the best healing outcomes by appreciating personality differences, addressing fear, being open to Eastern and Western medical philosophies, and recognizing insurance, legal, and pharmaceutical obstacles to optimal care. Rose presents a compassionate vision for healthcare where health professionals and patients work together to heal. Dr. Barry Rose is a board-certified orthopedic surgeon and the chief of orthopedic surgery and surgical division head for the Alameda division of the Palo Alto Foundation Medical Group, one of the largest multispecialty groups in California. He resides in San Francisco with his wife, Rose.